Underbelly have launched a new, exciting and colourful circus hub down on the Meadows this year, with two large dome shaped venues. Seek out Lost In Translation Circus in the Lafayette tent (a 700-seat venue) performing their show: The Hogwallops. The Hogwallops was commissioned by Showzam! Festival in Blackpool in February 2014. It has evolved and reinvented itself to become what is today, a muti-national team of performers – hence the name. 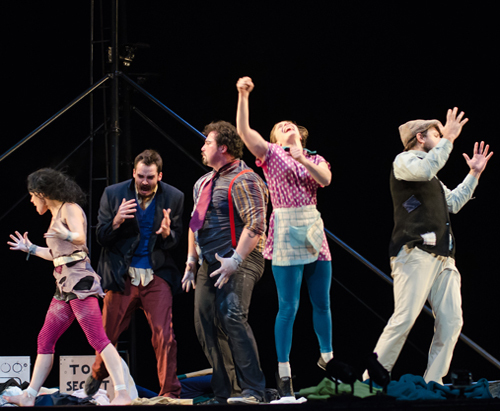 The show is primarily a piece of circus / theatre / comedic storytelling where we meet the Hogwallops family through a series of crazy chaotic adventures and circus slapstick. Inspired by Roald Dahl’s ‘The Twits’, and Ettora Scola’s film ‘Brutti, Sporchi e Cattivi’, the family of misfits stumble their way through acrobatic domestic pandemonium and comical skits. The multi-layered story interweaves itself through an acrobatic showcase of circus stunts. Meet Grandpa (Eduardio Ricciardelli), a headstrong and stubborn man celebrating his birthday and his love of bananas. Determined he doesn’t need his zimmer frame despite his chronic back pain. Roisin Morris’ acrobatic baking takes over the stage, followed by juggling jokes performed by Frederico (Thibaut Lerzervant) the family whipping boy. In my personal opinion, the star of the show. Frederico takes the traditional role of the clown and makes all ages laugh with his facial expressions and slapstick shenanigans, rather than any silly costumes or funny roses – thankfully! He falls in love with a lady in the crowd, which leads to some hilarious crowd interaction.